Chi-Card® for nine months - - Life Quest® Formulas, Inc. If you don't have, or can't afford, a Chi Generator; or just want to try out Welz chi power? This is for you. The Chi-Card® you will receive is connected to a Welz Chi Generator so the card can be used to enhance your personal chi, run improvement programs using Filter Packs, etc. 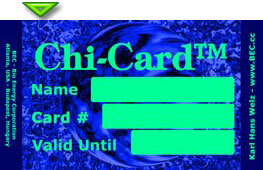 You will receive your Chi-Card® by e-mail (.jpg format) and you can print it yourself. Each Chi-Card® is unique and only works for you alone. Fee for 9 months - $29.00 + $10.00 setup fee.